Amidst calls for a touchscreen MacBook, Logitech introduced the next best thing: a keyboard case that converts the 2018 iPad Pro into a laptop. The Slim Folio Pro has a backlit keyboard and a design that protects the tablet and the attached Apple Pencil. We fully tested this just-released accessory for businesspeople and students, so don’t miss our review. Or our comparison of Logitech’s latest with the similar Apple Smart Keyboard Folio. The Slim Folio Pro uses a modified clamshell design. It closes like a traditional laptop, but when it opens part of the back becomes a kickstand. We tested the version of the accessory Logitech created for the newest 12.9-inch iPad Pro. When closed, it’s 11.3 inches by 9.0 in. by 0.9 in. It weighs 1.6 pounds. Together with the tablet, the combination goes easily into cases designed for 13-inch laptops. There’s also a version for the 11-inch iPad Pro. This is 10.0 inches by 7.7 in. by 0.9 in., and 1.2 pounds. The Slim Folio Pro comes in just one color: charcoal grey. The exterior a black plastic, and seems designed to offend no one, even if it won’t particularly appeal to anyone either. 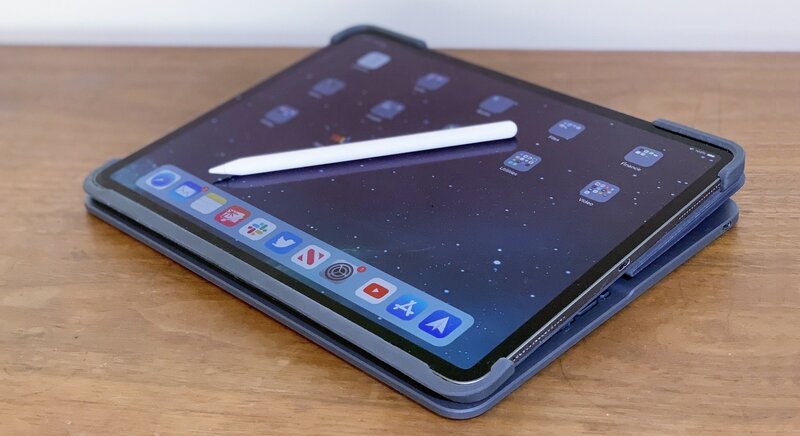 All the corners of the iPad Pro are covered with thick bumpers, the keyboard fits over the screen, and there’s two layers of plastic on the back. There are covers over the buttons. All this means the tablet is fairly well protected in the Logitech Slim Folio Pro from bumps and blows. Still, there are openings for the speakers, USB-C port, and cameras, so keep away from liquids and heavy dust. The Slim Folio Pro protects the latest iPad Pro, and holds the Apple Pencil 2 as well. This folio’s clamshell is held closed with a flap that also secures the Apple Pencil 2 when it’s charging from the iPad Pro. There’s an optional slot in the flap to slip the Pencil into if you’re really concerned about losing it, but the stylus won’t charge that way. This flap will also magnetically hold itself to the back of the case when you’re typing so it doesn’t just irritatingly flap around. To make your tablet into a laptop, open the clamshell then place the bottom of the iPad Pro in a groove just above the keyboard. It will solidly click into place, and be held there with magnets. A kickstand holds the tablet up securely, with no movement when the touchscreen is tapped. The Slim Folio Pro offers two viewing angles: 120 degrees, and 110 degrees, based on an adjustment to the kickstand. Lay the iPad Pro down on top of the keyboard with the display facing up to sketch with the Apple Pencil. The top of the screen will be tilted up just a bit, making drawing easier. The Logitech Slim Folio Pro is one piece. 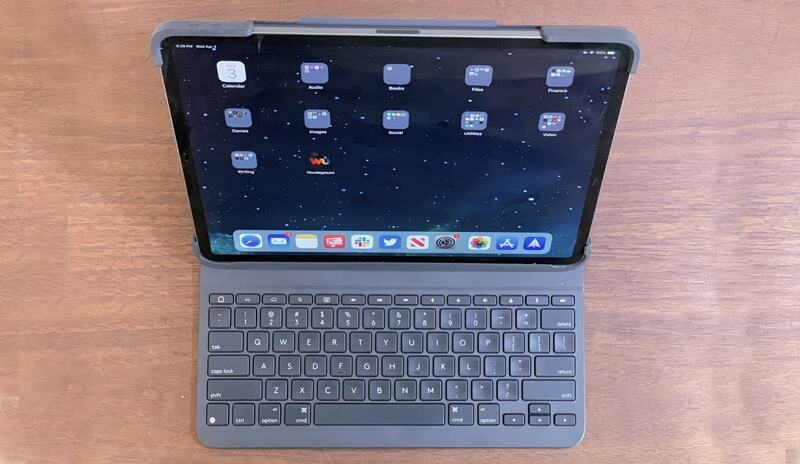 There’s no way to separate the keyboard from the shell protecting the iPad Pro. To use the iPad as a regular tablet, you’ll need to flip the keyboard behind the screen. That said, if you’re going to use your device like this for more than a few minutes you might be happier removing the Slim Folio Pro — doing so takes maybe 10 seconds. The combination is 3 pounds, and that’s a heavy tablet. The highlight — nearly the entire reason — of the Logitech Slim Folio Keyboard is the keyboard. Fortunately, it’s well designed. On our version for the 12.9-inch iPad Pro, the key area is 10.5 inches wide and 3.7 in. tall. Most keys are 0.6 inches square, and there’s 0.15 inches of space between them. That’s comparable to a laptop keyboard, and only a touch smaller than you’d expect from a desktop one. There’s nothing cramped about typing. Key travel isn’t great, but that’s typical of mobile keyboards. It’s about 1 mm. Still, that’s an enormous improvement over typing onto a touchscreen. Logitech added a row of function keys above the regular ones. This includes media controls for music playing in the background while you’re working. Professionals can appreciate the Slim Folio Pro’s laptop-style keyboard. Backlit keys make it easy to type in dim spaces, whether a classroom or an airplane cabin. The lights are white, and offer dim, brighter, or off. One of the few disappointments in the Slim Folio Pro is that it uses Bluetooth. This case wraps around the back of the iPad Pro so it could have attached to the Smart Connector for inter-device communication. Still, Logitech removed just about all the pain points. There’s no on/off switch needed, as just setting the tablet up into the laptop shape activates Bluetooth. Closing the clamshell both shuts off the tablet’s screen and the wireless connection between tablet and keyboard. The internal battery required by Bluetooth is charged via a USB-C port on the right side. Logitech promises three months of use on a single charge, which isn’t unusual for a keyboard like this one. The top competitor for Logitech’s keyboard case is undoubtedly the Apple Smart Keyboard Folio. The Slim Folio Pro does include some features not available in its rival, including backlighting for the keys. Beyond that, Logitech’s keyboard is easier to type on. Apple’s offering is a solid piece of fabric with raised keys so there’s very little key travel. In addition, the Slim Folio Pro is more protective. And it costs a lot less. Which isn’t to say the Apple Smart Keyboard Folio doesn’t have advantages. It’s about half as thick, and about 30 percent lighter. It’s much easier to take the iPad Pro out of this case, and put it back in too. Employing the Apple Smart Connector means never having to fool around with Bluetooth or charging the keyboard. 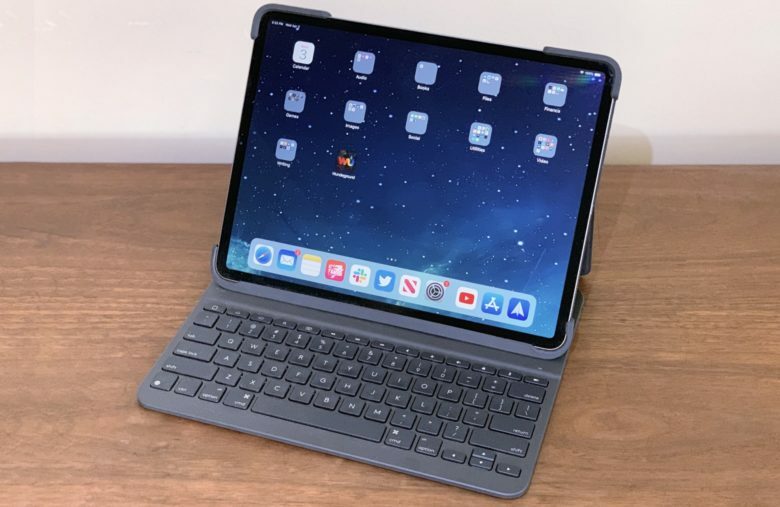 The 2018 iPad Pro is already a powerful productivity tool, and adding the Logitech Slim Folio Pro’s excellent keyboard makes it even more useful. It’s a bit bulky though, doubling the weight and thickness of the iPad. Still it brings welcome protection for the tablet. Lighter keyboard cases aren’t as protective. The version of the Slim Folio Pro for last fall’s 12.9-inch iPad Pro is $129.99. Logitech’s version for the first 11-inch iPad Pro is $119.99. For comparison, the larger iteration of the Apple Smart Keyboard Folio is $199 — that’s almost $70 more. The smaller version is $179, which is about $60 more. At the time of this writing, the Logitech Slim Folio Pro is not yet available to the public. However, it’s scheduled to launch before the end of April 2019. Logitech provided Cult of Mac with a review unit for this article. See our reviews policy, and check out more stuff we recommend.